As EU carbon emissions permits drop to a record low price of under 6 euros a ton with no hope of recovery, many wonder why EU policymakers are trying to keep a zombified carbon market alive despite its obvious failings. The overload in credits is caused partly because limits on discharges were set before the euro area entered recession in 2008, and haven’t been tightened. Yet, the CDM market has even deeper flaws and is hurting and costing the EU, the climate and Africans. 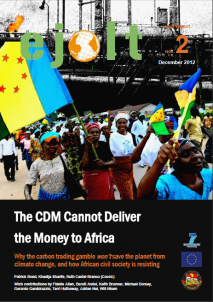 To find out why, read this 120 p report: “The CDM in Africa Cannot Deliver the Money. Why the carbon trading gamble and ‘Clean Development Mechanism’ won’t save the planet from climate change, and how African civil society is resisting”. The idea of inventing a property right to pollute is effectively the ‘privatization of the air’. The most polluting corporations and the World Bank – which is most responsible for fossil fuel financing – are the driving forces behind the market. They engage in systemic corruption to attract money into the market even if this prevents genuine emissions reductions. Examples of proven fraud, suspected fraud and double counting cover the big majority of projects. Many projects, such as mono-cultural timber plantations, forest ‘protection’ and landfill methane-electricity projects, have devastating impacts on local communities and ecologies. Carbon markets are fast becoming a multi-trillion dollar speculative bubble, similar to exotic financial instruments associated with Enron’s 2002 collapse. After the launch of this report last April, we asked all companies that we wrote about for a reaction, through EJOLT partner Business and Human Rights. Four companies responded. None was able to challenge the fundaments of the research and our conclusions. The authors of the report suggest an immediate moratorium on all new carbon credits in the CDM and the ETS as a first step, Following this, they argue that the CDM and the ETS should be decommissioned – while maintaining and upgrading the level of emission cuts the EU has committed to. Finally, this decommissioning should not decrease adaptation money for Africa but increase it, for the simple reason that they have the right for compensation to the many damages caused by these carbon markets. A fair plan to stop climate change must look beyond market solutions to market failure and move towards recognition of responsibility for breaking the climate, binding emissions cuts and transfers to victims in order to foot the bill for the climate debt.